Ayurveda, a system of self care that originated in India more then 5000 years ago, is becoming very popular all over the world, with hundreds of healers incorporating it into their practices and thousands of people using its well tried principals and therapies to improve their well being. Ayurveda tells that the health is not, the body free from diseases, but, the health is physical, mental and spiritual happiness and long span of healthy life. Ayurveda teaches the way of healthy living, because the main object of Ayurveda is prevention than the medical system. If you are not getting any solutions for your health problems. we are with you all the way, all the time. The aim and objectives of Ayurveda are mainly two, the first being the maintenance of positive health, and treatment of diseased and the other maintaining social harmony. These clearly defined objectives are achieved through logically developed means in a classical way. Ayurveda represents a well-codified human care system and speaks of the art and science of health and healing. The conceptual and operational framework of Ayurveda is wide enough to include all that is essential to make a man healthy and happy. . It assumes fundamental continuity between all elements of universe and as a natural extension of this ideology perceives man as an integral part of nature. Ayurveda underscores the fundamental commonalties observed in man and nature and attempts to explain the human life in its totality. 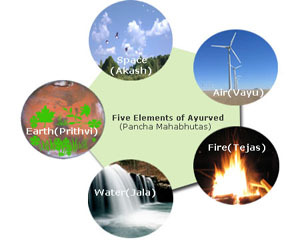 The most fundamental and characteristic principle of Ayurveda is called "Tridosha" Or the "Three Humors". The structural aspect of our body is made up of five elements, but the functional aspect of the body is governed by the three fundamental energies or principles which govern the function of our bodies on the physical and emotional level. 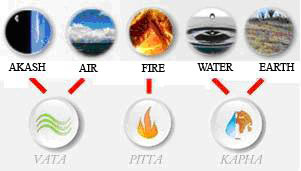 The three energies are known as Vata, Pitta, and Kapha. Ether and Air together constitute VATA; Fire and Water, PITTA; and Water and Earth, KAPHA. Vata-pitta-kapha are present in every cell, tissue and organ. Every individual has a unique combination of these three doshas, which determine the physiologic constitution (Prakriti) of an individual. On the most fundamental level, Vata regulates movement and is represented by the nervous system. Pitta is the principle of biotransformation and is the cause of all metabolic processes in the body. Kapha is the principle of cohesion and functions through the body fluids. Without all three energies, we simply could not exist. Represents the solid state of matter. It manifests stability, permanence, and rigidity. In our body, the parts such as bones, teeth, cells, and tissues are manifestations of the earth. Earth is considered a stable substance. Characterizes change and represents the liquid state. Water is necessary for the survival of all living things. A large part of the human body is made up of water. Our blood, lymph, and other fluids move between our cells and through our vessels, bringing energy, carrying away wastes, regulating temperature, bringing disease fighters, and carrying hormonal information from one area to another. Water is a substance without stability. Is the power to transform solids into liquids, to gas, and back again. In other words, it possess power to transform the state of any substance. Within our bodies, the fire or energy binds the atoms together. It also converts food to fat (stored energy) and muscle. Fire transforms food into energy. It creates the impulses of nervous reactions, our feelings, and even our thought processes. Fire is considered a form without substance. Is the gaseous form of matter which is mobile and dynamic. Within the body, air (oxygen) is the basis for all energy transfer reactions. It is a key element required for fire to burn. Air is existence without form. Is the space in which everything happens. It is the field that is simultaneously the source of all matter and the space in which it exists. Ether is only the distances which separate matter. The chief characteristic of ether is sound. Here sound represents the entire spectrum of vibration. In Ayurveda, the place in which to determine the elements around us is not a science laboratory, but the human body. We use our senses of hearing, taste, touch, sight and smell to identify the surrounding elements and their qualities. The pancha mahabhutas theory may sound simplistic, but it is actually a very sophisticated method of classifying not only all of the objects found on Earth but also the natural cycles experienced on it like days, seasons and life itself. This is because the elements dominate at particular times, depending on the conditions experienced and observed. In short the five element theory explains the similarity between humans and the natural world surrounding them. In our body, space/akasha is present wherever there is a cavity like in the nostrils, mouth, ears, throat, lungs, and stomach; air/vayu in movement of the lungs, heart, stomach, intestines and joints; fire/agni in all metabolic activity, the eyes, intelligence and body temperature; water/jala in all plasma, blood, mucus, and saliva; and earth/prithvi in any solid structure like fat, muscles, skin, nails and hair. The basic elemental compatibility or similarity between Earth and humans clarifies why substances found in the natural world (plants, herbs, foods) are usually harmonious with the human system. They can be easily absorbed and cause no adverse reactions or side effects (if consumed in appropriate quantities) because they are fundamentally the same in character and composition. This is why foods and herbs are able to heal the human body. Vegetation can repair and restructure humans because they share a common elemental basis.